There is something about the statement “move closer to the rhino” that should give most everyone pause. What is bizarre in a case out of South Africa is that the highly suspect suggestion came from a game keeper who was taking pictures of a couple from Johannesburg. You guessed it. 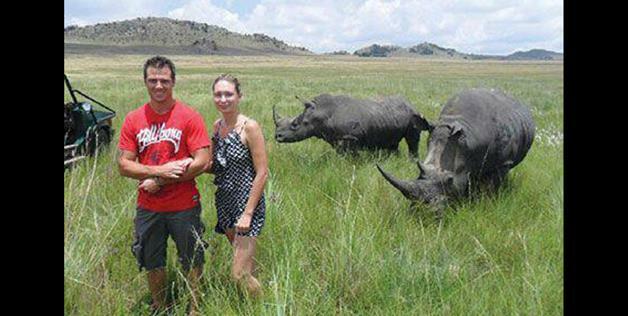 The picture was the last record of the couple shortly before the rhino attacked Chantal Beyer, a 24-year-old woman. Chantal Beyer said the game park owner snapped pictures and suggested that she “stand just a little bit closer” to two rhinos just a few feet away. One rhino then attacked her and penetrated Beyers’ chest from behind, collapsing a lung, breaking ribs and almost killing her. In the United States, the liability of the Aloe Ridge Hotel and Nature Reserve would be obvious and extreme. While some states give zoos and other animal reserves protection from strict liability, this would be an easy case for negligence. Moreover, as a keeper of a wild animal, strict liability would seem to apply absent such a law in the United States. Normally, there would be a question of whether the establishment had possession or control of the animal. This was the issue in Woods-Leber v Hyatt Hotels of Puerto Rico (1997), Hyatt was found not to be strictly liable for an attack on its grounds by a rabid mongoose on a guest. It was not viewed as possessing the animal since wild animals could move freely on to the property. The same issue came up recently in the United States in the case of the woman who had her face ripped off by a neighbor’s pet chimpanzee and a case in Arizona involving a javelina. Here however the employee actively encouraged the woman to get close to a wild animal. Darren – I’ll also attest to the Segway’s superiority to a scooter.